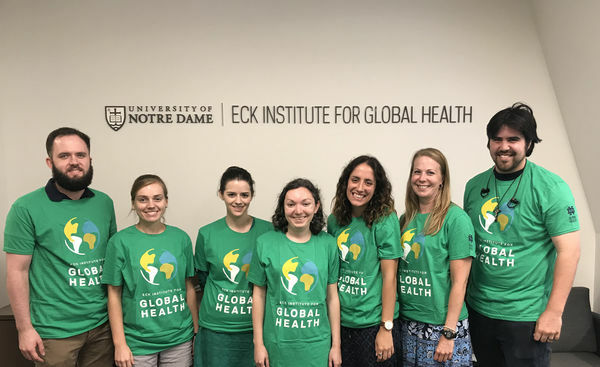 Seven University of Notre Dame graduate students have successfully received fellowships from the Eck Institute for Global Health (EIGH). The EIGH Graduate Student Fellowship Program was established to support students enrolled in the Notre Dame doctorate program who have an interest in global health research. Katelyn Carothers, graduate student of biological sciences, for her project titled, “Role for a secreted Streptococcal protease in host cell and polymicrobial interactions.” Carothers received her bachelor’s degree from Manchester University and her advisor is Shaun Lee, associate professor of biological sciences. David Dik, graduate student of chemistry and biochemistry, for his research titled, “Cross-talk between cell-wall recycling and antibiotic resistance in pathogenic bacteria." Dik received his bachelor’s degree from Hillsdale College and his advisor is Shahriar Mobashery, professor of chemistry and biochemistry. Rose Donohue, graduate student of biological sciences, for the project, “Understanding neglected tropical disease control from a socio-ecological perspective.” Donohue received her bachelor’s and master’s degrees from Notre Dame and her advisor is Edwin Michael, professor of biological sciences. Catherine Flanley, graduate student of biological sciences, for her study called, “Genetic differentiation and immunogenicity of nine salivary proteins from our geographically distant populations of Phlebotomus papatasi, a known Leishmania vector.” Flanley received her bachelor’s degree from the University of Pittsburg and her master’s degree from East Stroudsburg University and her advisor is Mary Ann McDowell, associate professor of biological sciences. Rachel Oidtman, graduate student of biological sciences, for her research, “Inferring and forecasting pathogen transmission dynamics by confronting models with epidemiological time series.” Oidtman received her bachelor’s degree from Cornell University and her advisor is Alex Perkins, Eck Family Assistant Professor of Biological Sciences. Kevin G. Sanchez, graduate student of biological sciences, for his study, “The mechanisms of ESX-1 feedback regulation in Mycobacterium marinum.” Sanchez received his bachelor’s degree from Marquette University and his advisor is Patricia Champion, associate professor of biological sciences. Morgan Smith, graduate student of biological sciences, for the research, “Data-driven computational modeling of macroparasitic disease transmission and elimination.” Smith received her bachelor’s degree from Villanova University and her master’s degree from Notre Dame and her advisor is also Michael. If you would like to learn more about the EIGH Graduate Student Fellowship program, please visit https://globalhealth.nd.edu/education-training/phd/. The Eck Institute for Global Health at the University of Notre Dame endeavors to promote research, training, and service for the advancement health standards for all people. The institute recognizes health as a fundamental human right and aims to support those in developing countries who are disproportionately impacted by preventable diseases. To learn more about the institute, please visit globalhealth.nd.edu. Originally published by Brandi Klingerman at globalhealth.nd.edu on September 12, 2018.